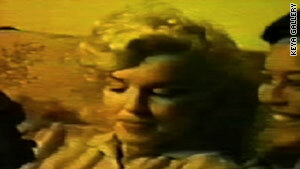 The woman who made the home video of Marilyn Monroe kept it packed away for 50 years, except to show FBI agents. Los Angeles, California (CNN) -- The copyright to a home movie of Marilyn Monroe "just sitting around" with friends will be offered through an online auction this week, according to a man who found the film while researching the actress' death. A short clip of the four-minute, silent 16 mm film provided to CNN to shows Monroe puffing on a cigarette, laughing and drinking wine on a couch. An FBI agent involved in the investigation of Monroe's death on August 5, 1962 -- which was ruled a suicide by drug overdose -- tipped off collector Keya Morgan to the film's existence. Morgan was interviewing the agent for a documentary titled "Marilyn Monroe: Murder on Fifth Helena Drive," he said. The documentary, due out next year, examines the theory that Monroe was killed by government agents because of her affair with President John F. Kennedy. Morgan said he paid $275,000 for the faded color film because it is "very rare" to find images of the actress' private moments. "It's a side of Marilyn that no one has ever seen before," he said. "You see the private Norma Jeane, the girl. You don't see Marilyn Monroe, the movie star." Monroe changed her name from Norma Jeane Baker to Marilyn Monroe early in her acting and modeling career. While she puffs the cigarette, "she's also sniffing her armpit and acting silly," Morgan said. The woman who made the film asked that CNN use only her first name, Gretchen, to protect her identity. "We were just getting together," Gretchen said. They were "just sitting around" in a New Jersey apartment, singing songs, she said. The film was made in the late 1950s; Gretchen said she could not recall the exact year. She kept it packed away for 50 years, except for loaning it to FBI investigators, she said. Gretchen retained the copyright, which Morgan is helping her sell through an eBay auction expected to begin Thursday, he said.